His daughter needs her mother. And Gavin Gray will do anything for Tory—even reunite with the woman who abandoned them. That’s the only reason they’ve moved to Squam Lake, his ex-wife’s last known address. Now it’s a waiting game. That game has suddenly gotten more complicated. Because of Allison Bennett, the next-door neighbor he never expected to fall in love with. 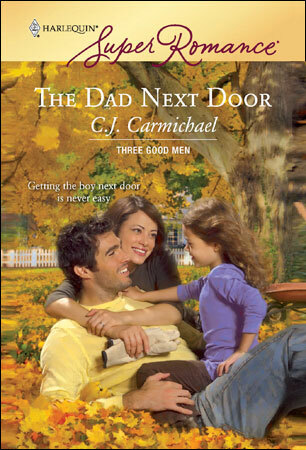 Just as their future looks promising, his ex-wife returns with a past that haunts them all. I enjoyed researching the New England setting for these stories. I've always had a special love for the changing colors of the leaves during autumn and was thrilled to have an excuse to visit Vermont and New Hampshire in October. She wrote down the cost and product number in her notebook. It was fun shopping with Gavin and his daughter. Just as it had been fun to drive downtown with them in the red station wagon. She felt a bit like she was playing at the role of wife and mother and the fit was not that bad. Not bad at all. “You can count on that.” Warmth spread through her as she turned up the next aisle. Here were faucets and sinks and she made note of several that would work with her new plans. Allison scanned the selection, then pulled out the one he wanted. “Thanks, Allie.” He squinted at her. “What are you up to, today? You look good. Happy.” He snapped his fingers. “Let me guess. You and Tyler—"
“It’s the new neighbor I was telling you about, Dad.” Just on cue, Gavin appeared, obviously looking for her. “Well, how much poorer am I now?” he asked, coming up behind her, touching her elbow. The men took stock of one another and Allison could tell her father was impressed. When Gavin turned away for a second, to call for his daughter, her dad gave her a wink and a nod of approval. She felt a little embarrassed. Her dad really was the most incorrigible matchmaker—she was almost certain Gavin had seen the wink, too. But at least her father wouldn’t keep harping about Tyler anymore. Then Tory came running toward them and everything changed. At the first sight of the little girl, her dad paled. She heard him swear under his breath. Her father never swore. “Dad.” Allison was mortified. She’d told her father that the new neighbor had a child. Unless it was the resemblance to Marianne that had him spooked? “That girl. She’s looks just like—"
Her father gaped at her. It was a lot to take in, she had to admit. “Yes. But the only parent she really knows is Gavin. Marianne deserted her when she was only one-year-old.” She emphasized the age, wanting her father, finally, to understand the sort of person Marianne really was. Her dad ran a hand over his face, as if wanting to block the truth of what she was saying. “Poor Marianne,” he said softly. “I thought he made a good first impression.” Until his daughter appeared on the scene. “Well, yes. But that’s for Tory—"